On the day of Karthigai Deepam (Dec12), the Vardha cyclone blast Chennai and we couldn’t make arrangement of lamps as planned before. And I was looking forward to this day to make photos out of lights, but the cyclone ruined it well and we shifted to the upstairs to keep away difficulty. 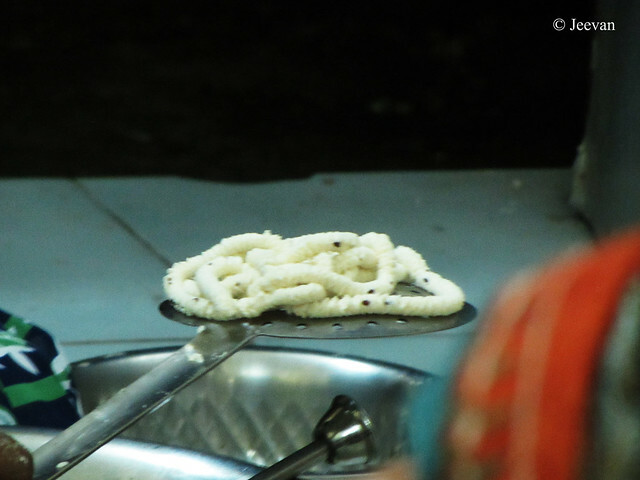 And for those unknown about Karithigai Deepam, it is a south Indian Hindu festival celebrated on the full moon day of the Tamil month Karthigai (that falls between Nov-Dec) and it is also called as festival of lights alike Diwali. Thought we haven’t celebrated, it wasn’t meant that we didn’t lit lamps. I think almost houses in Chennai and suburbs could have lit a lamp or candle on that day (and days further) to keep away the darkness of night in the absence of electric power. 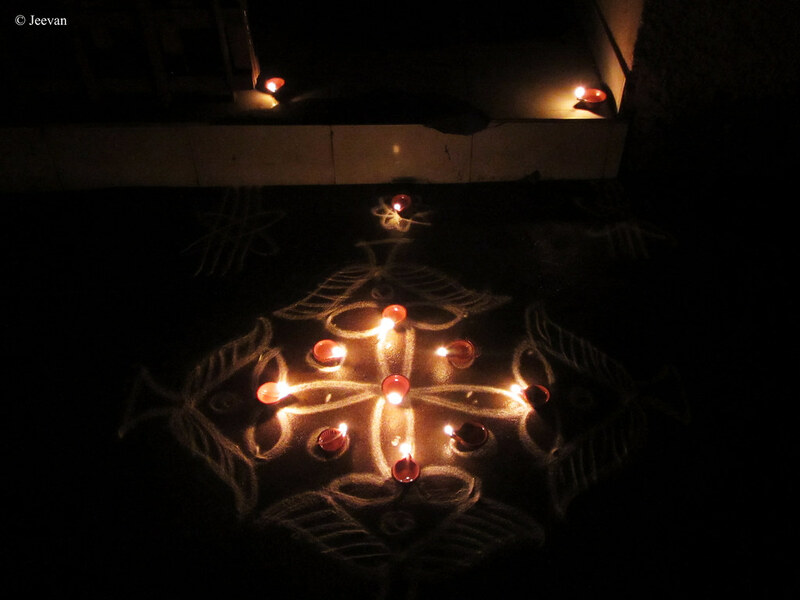 Despite have no power for couple of days, the oil lit lamps have burnt lot, and we made a small arrangement of clay lamps at the doorstep marking the festival at the next day. Karthigai Deepam is lit for 3 days at homes and lighting the oil lamps are considered as auspicious symbols and believed to dive off evil forces and let in prosperity and joy. 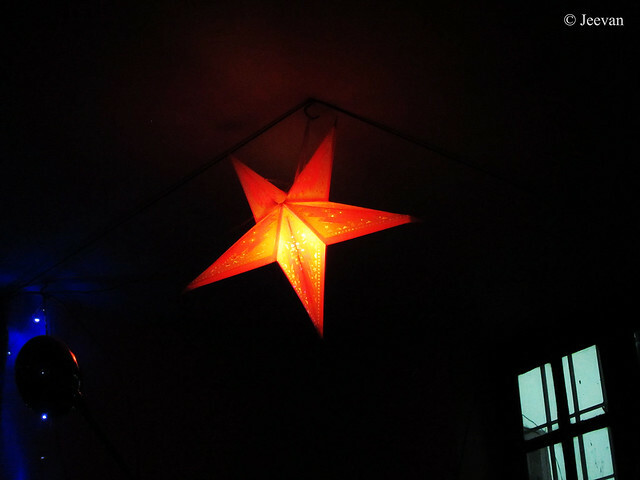 But for me it’s quite photogenic and joy of beauty in light and lamps form. Btw. Wish you all very Happy New Year, once again! Hope the year ahead is best for all. 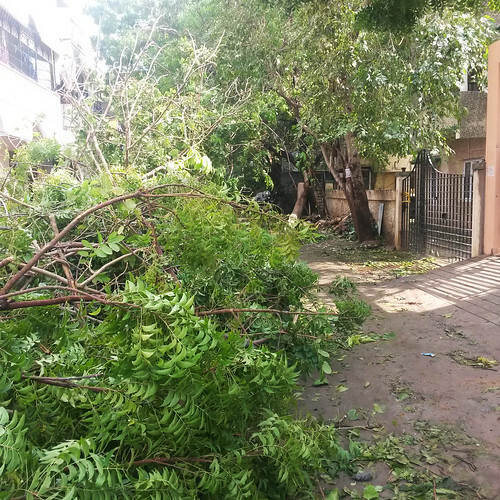 As you all know cyclone Vardha has brought down thousands of trees across the city of Chennai and the suburbs, has also left many trees skeletons. The trees were battled by the gusts leaving almost trees naked trunks and remaining was left to dry leaves as trees expose to die blow. 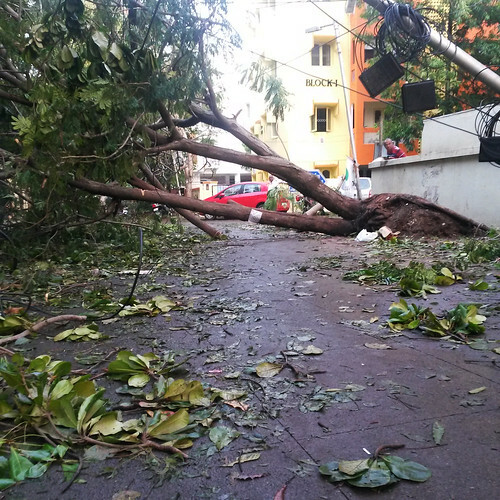 Last week I was around the neighbourhood clicking photos on the trees on way to the beach, and one of the beautiful roads of Chennai, Besant Avenue, with canopy of trees experienced the worst disaster in decades with many tree falls marked the Ave. 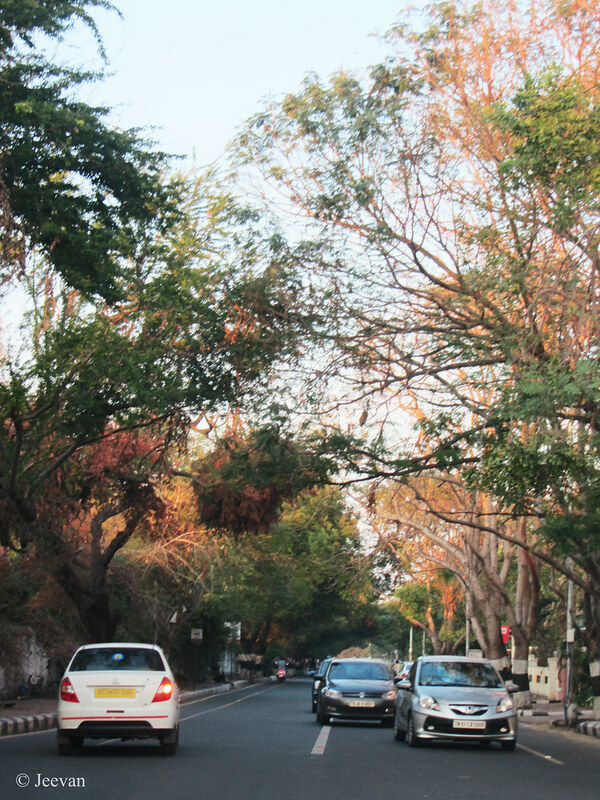 Being evening and expose to glowing sunset, the dry leaves and bare trunks brings out the glory of trees and I really enjoyed taking photos with couple of lanes turn picturesque, perhaps because of the cleaning process of the aftermath of cyclone. 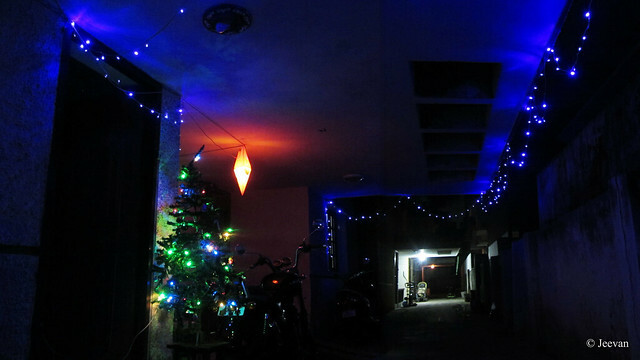 Last year I didn’t decorate for the Christmas unlike previous years and similar to 2013, when I fall for femur fracture and took quite bed rest, and last year the disaster rain and flood keeps away the spirit for celebrating Christmas. Though this year to the cyclone Vardha created an environmental havoc and be the reason for number of tree fall, the mood for celebration couldn’t be avoided because the intend for the merry Christmas has been in mind even before our honourable Chief Minister passed away, leaving a great void. I made arrangements on my personal interest and thanks to my parents for supporting on decorating the Christmas tree and lighting the portico. I too was watching some Christmas movies for last few days to keep up the festival spirit and I always believe festivals are to celebrate and bring together the people for sharing. “Jingle all the way” and “Christmas Vacation” are quite fun movies, unlike “The Christmas story” which moved me really and captured minute beauty in the family and relationship between brothers. But it was a movie actual based on Christmas gifts and the little boy (elder son of the family) acting was natural and could easily connect with childhood of everyone. 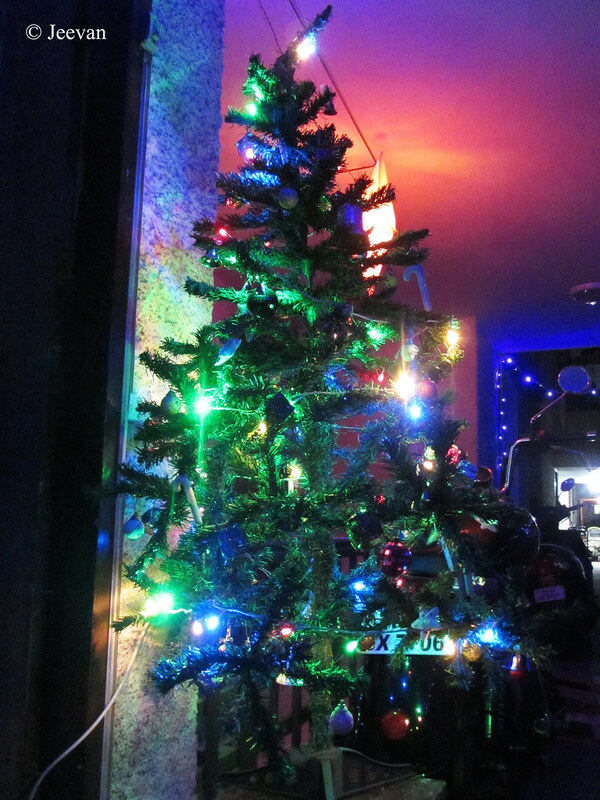 Wish you all Merry Christmas and Happy New Year… Hope it was a fabulous year for all. During a visit to Kanchipuram, I capture this hording placed atop a building in a very busy road that has number of textile shops. 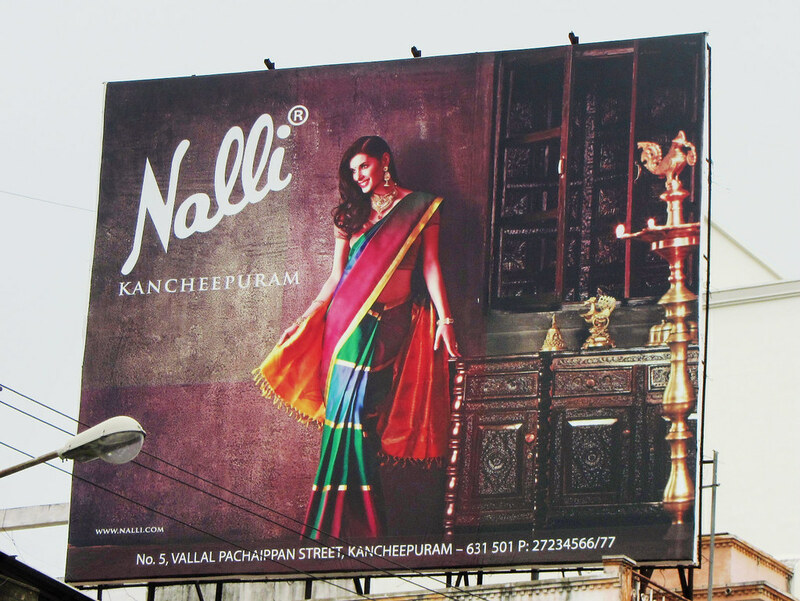 Kanchipuram is world famous for silk saree and the Kanchipuram silk has been recognized as a geographical indication by the Govt. of India in 2005-06. This shot wasn’t purposely shot for the meme, but the hording was eye-catching from the distance and I couldn’t skip the traditional beauty appear overall. 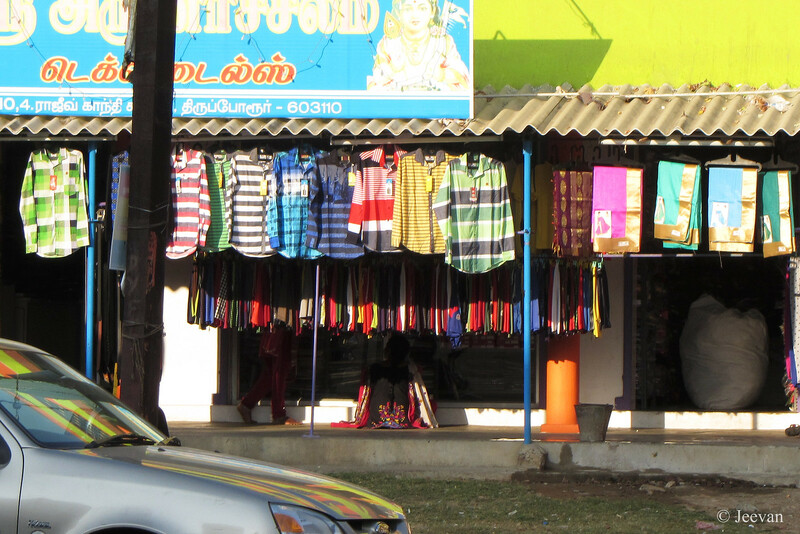 Only when I was looking for the picture to post at RGB Monday I noticed the shades of red, green and blue in the sari of the charming lady. Thank you for the colorful play! Please leave your link-in at the comment section (along with your comment) until i come up with a link-in gadget. And it will be mentioned at the end of the post by me later. 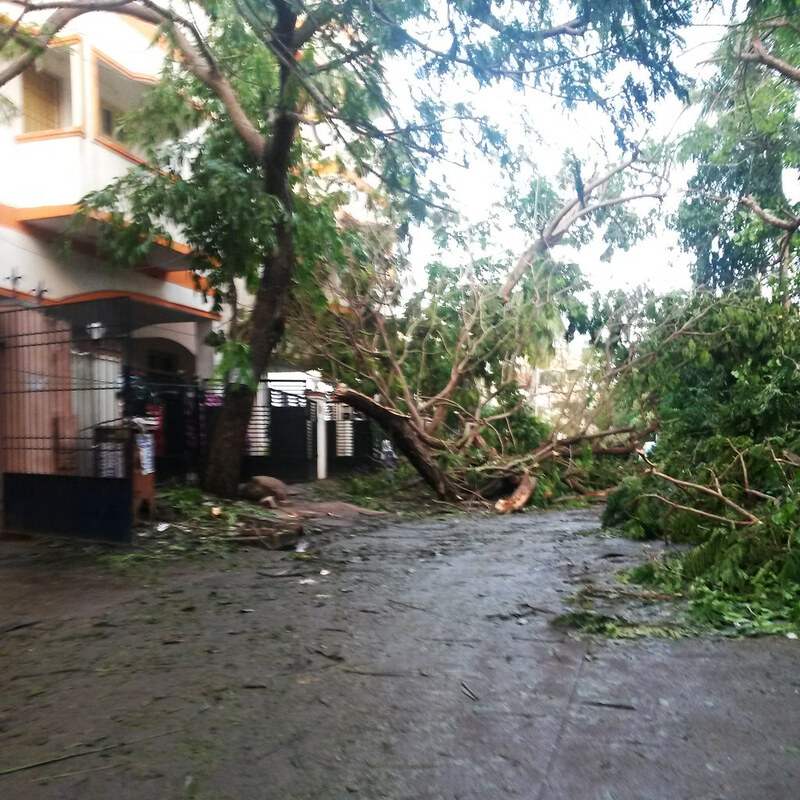 Cyclone Vardha stroke Chennai on Monday created an environmental havoc, bringing down thousands of trees across the city (which is estimated to go beyond 10,000) turning into a forest environ and ruin. It’s really hard to describe the state, although there isn’t much loss of lives, the trees aren’t less than anymore and what we have lost is impossible to replace immediately. 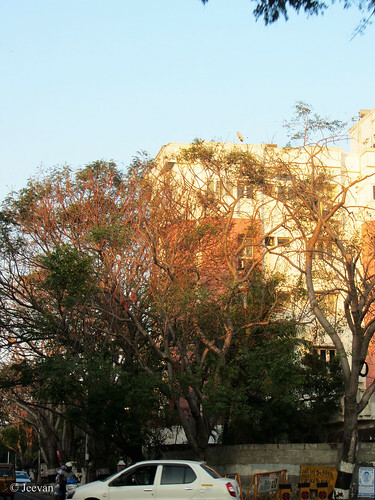 Most of the trees are at least more than 10 to 50 years old. 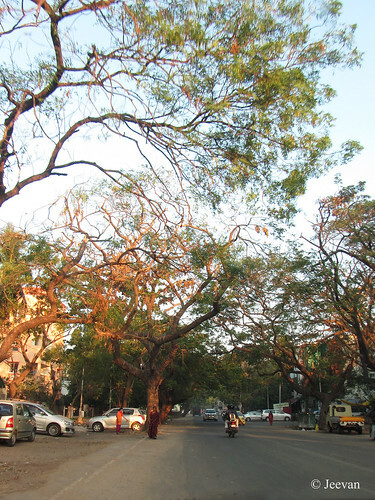 The city recorded high wind velocity of its history, lasting up to 140km speed smashed almost everything it could, from trees to sheet roofs, hoardings to electric poles and transformers, flipped cars and bus… its unimagined before that we face a great damage to our breathing source - trees. 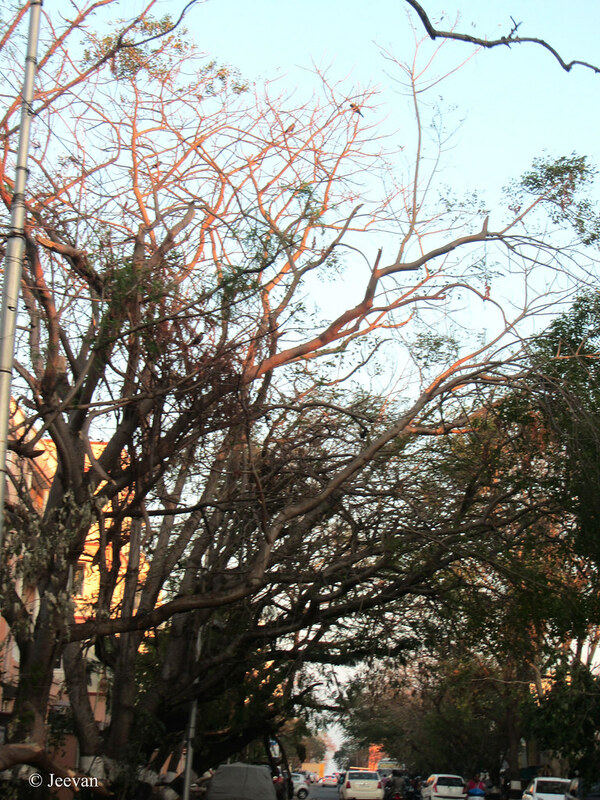 Almost streets in our city faced a tree fall! I ever heard or seen a situation alike and even on our street there’s half a dozen tree fall. The Vardha cyclone had been pretty fast and doesn’t left with enough time to prepare well, but we still managed good at least preserving the lives. We well aware there won’t be power on the day of landfall and following days, so we filled our overhead tanks and charged all the battery operated in advance, perhaps the last year’s devastating flood taught us to be precaution than before. As expected the power goes off as soon wind started to blow with heavy rain and the DTH went out of signal, from which we were learning about the progress of the cyclone and the mobiles also lost network in next few hours. It was a storm, a howling we ever heard before. The tense was at high while the rainwater continues to rise around the home and the terrific wind creating a feel of unsafe to find out. 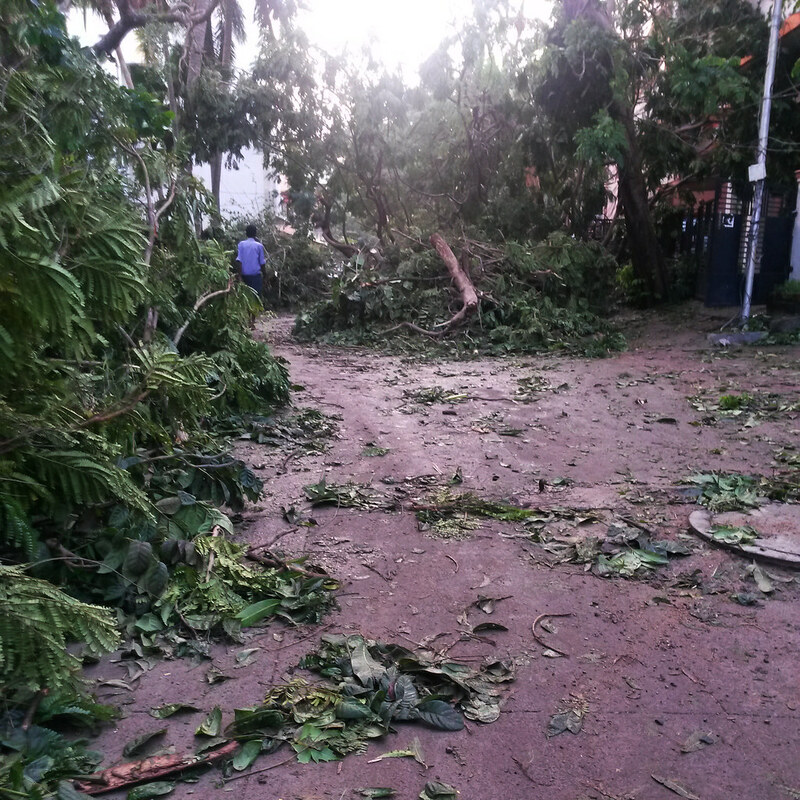 We did none until the cyclone took a brake by 2.pm. Glad the mobile network lasted sometime and if not we would have thought the cyclone landfall quite. I know it was a very severe storm but never to be very extreme and long-lasting. It took more than 7 hours for the cyclone to completely landfall with an eye (centre part of cyclone) of 100km, which passed in quietness for about 2 hours, before resurface into another extreme twist and turns. 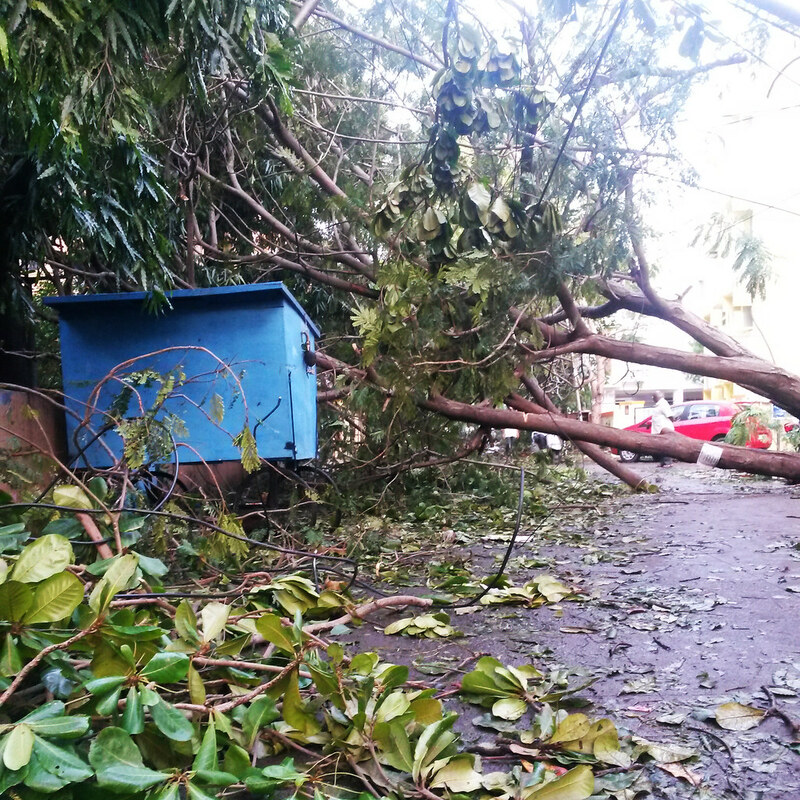 The road was blocked on both the sides of the house, because of the tree fall; we had no option just to move to the upper portion of this house which was rented but unoccupied. As we’re uncertain about the rainfall, due to storm, we moved to upstairs after getting permission from the “down-to-earth” household. But there wasn’t much rain after the first stroke and the rainwater also restraint entering the house but the streets turned messy due of fallen leaves and stalks. There was no power for quite 2 days/night, but had enough power in the inverter for a day which we used for charging mobiles (for the torch), battery light, mosquito bat to spent our evening and night with less trouble. The next day power was restored at our uncle’s house (in the next street) and we brought the inverter there and got charged for another night. It was our neighbours, whose protest and road blocking brought back the power immediately, if not it would have taken a day or two. Glad we moved our car to another location… the wind was very extreme and there was a loud bang outside. 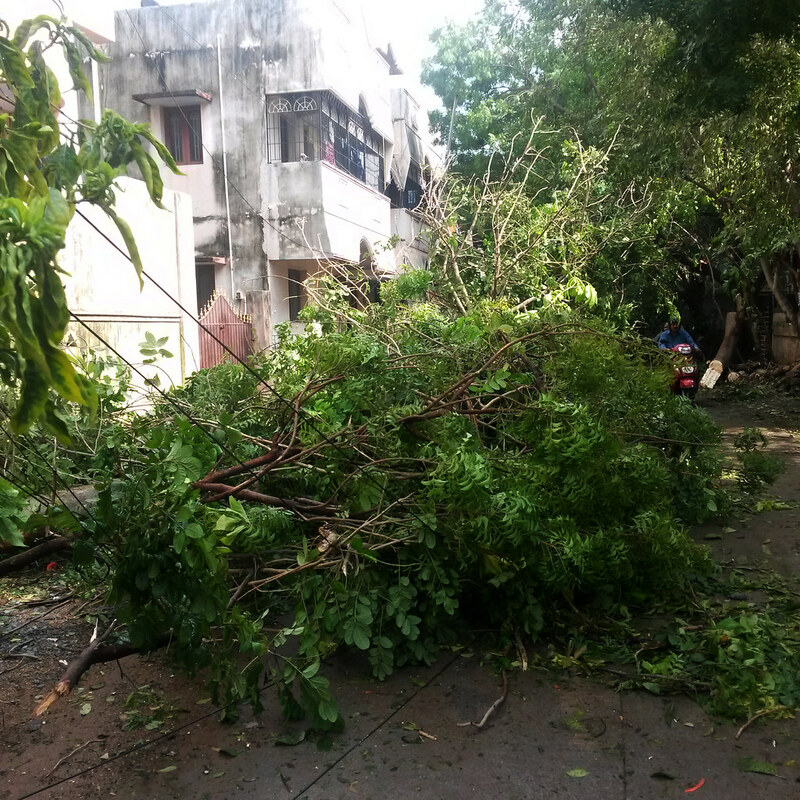 Yes, a 30 feet tall cotton tree fell completely and slightly across the road. And if the wind was blown from the east it would have blocked our way and crashed the car. 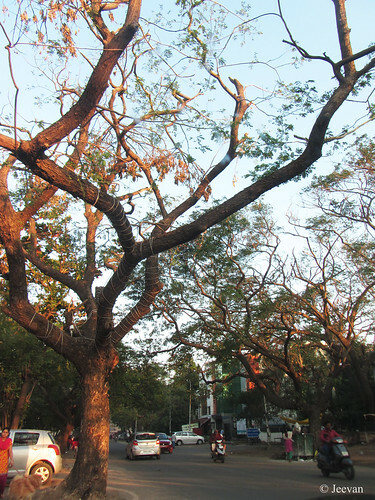 I really need to say I miss this tree, because it was a cotton tree and if the pods broke away the cotton would float in the air and many green parakeets visit this tree to feed on the cotton pods seeds. It’s really sad to think how many birds missed their favourite trees in the cyclone Vardha, a word our Chennaities will not forget for long. When the centre part or eye of the cyclone landfall suddenly number of birds appears from somewhere, started to circle the sky near a skyscraper in neighbourhood, perhaps looking for some hideout to protect them from the storm. I learned from the metro plus, many birds from the deep sea have been pulled into the city by the cyclone and the water birds were landed on the marshlands of Pallikaranai and Thuraipakkam. 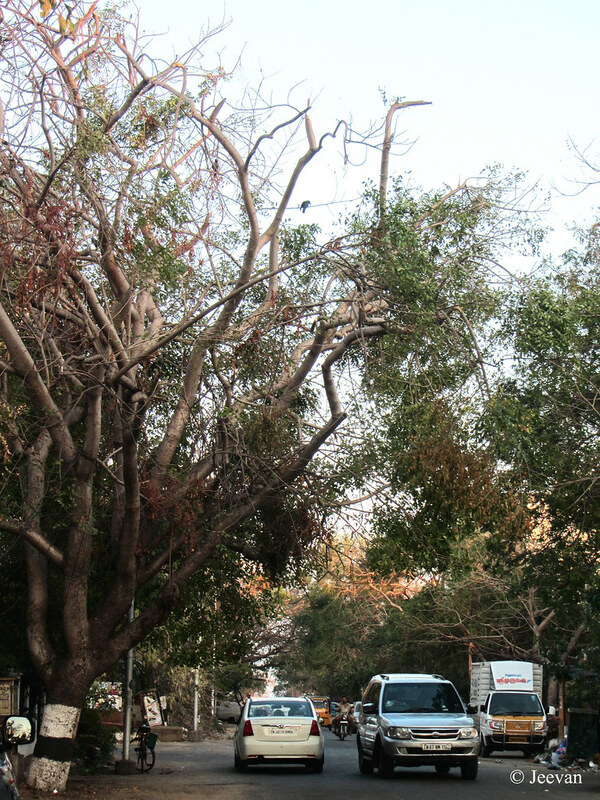 I really wonder how birds manage such strong winds and nesting of birds… but I am happy to see crows, parakeets and babblers back in the neighbourhood. The sudden rushes of birds on the day were looked similar as sparrows and were flying so terrified and bewilder to head where. Hope there’s a sense of peace in their environment despite great loss of trees – arresting. It’s quite miserable to the state of Tamil Nadu missing the beloved Chief Minister, Dr. Jayalalitha, in an unexpected down to illness. We may love or hate her, but her achievements and attitudes toward the Tamil people couldn’t be denied by anyone apart her self-confidence, courage and commendable leadership at governance. She perhaps corrupted at a time, and made mistakes like a regular human, but for that alone we could not stop thinking about her wonderful deeds that helped achieving the state in its goals. Her mourn to death has proved that everyone admired her in some ways esp. 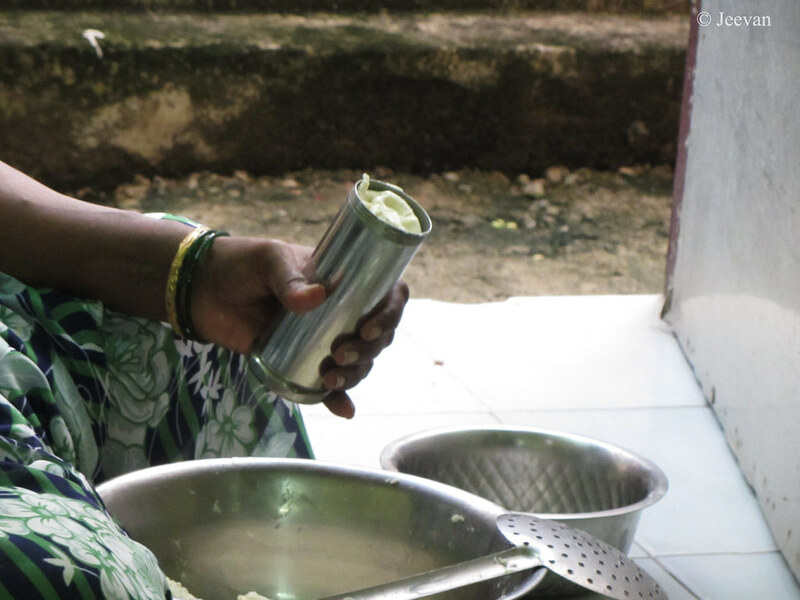 being a woman her empowerment had inspired millions of women, who seeks rights to achieve their dreams, and she stamped a irremovable ink in frame and fame as Amma – meaning mother. The entire state has blocked their ways, prevented their day to day activities and took troublesome to pay homage to their honourable Chief Minister leaving away all the differences. There’s any political leader received such a multitude in last 3 decades after the MGR’s crowd pulling funeral. It’s truly amazing and admirable how a woman administered the regime in single hold and in a court where only men ruled so far. Her regime had done innumerable goodness to the society and her rainwater harvesting project, urging every household to implement the system is one of the best, continues to improve the groundwater and prevents flooding enough. One of the great achievements of her lately was sustaining her regime continuously for 2nd time, on the footstep of her preceptor MGR. Though we may complain money played a role on the success, but undoubtedly it wasn’t the only reason and I myself believed only she could give better governance than the existing political parties. Her leadership was pretty strong, though she was the only commander on the sail everything worked fine on her diligence. The Cauvery issue handled by her is worth commendable and I believe we could have not reach this much, where Supreme Court’s intervention and fasting the progress of forming Cauvery Water Management Board on implement our right and share of water, if she hadn’t endeavour die hard. 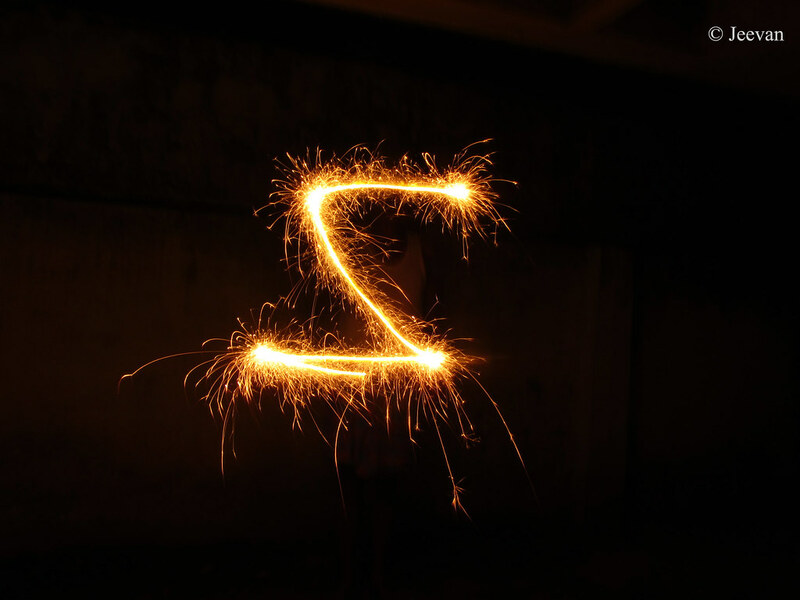 How many letters? I think she could be the only Chief Minister across the India to write innumerable letters to the Prime Minister on the requirement of the state. And most of them were related to Cauvery water dispute and rescuing fishermen from the grip of Sri Lankan Navy. She might be a great actress and pretty heroine in past but I haven’t watched many of her films and my introduction to her was only as Chief Minister and I have seen her being outstanding and sometimes disagreeable. On the political front I admire the way she dominate the regime and party, because leading a party (with about 15 million members) with restraint is impossible unless herself being a disciple, of the former. And being silent always I really wonder how she continue to retain herself among the public despite many ups and downs happening in her personal and political life. And also maintains a lifestyle that’s quite mysterious where meeting she is also uneasy even for her party men/women. 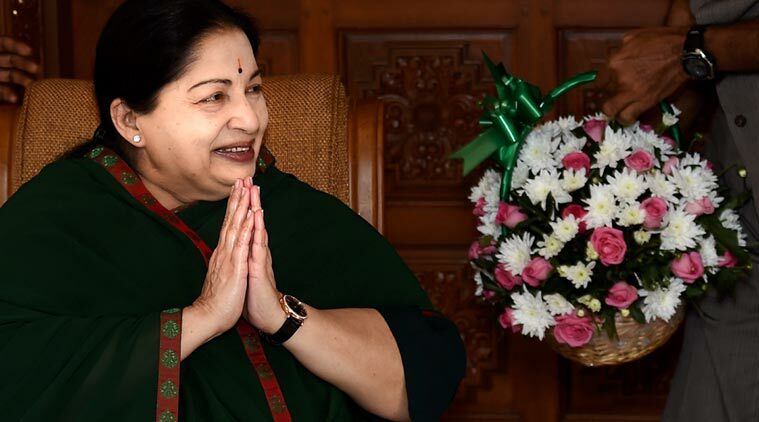 Now, her demise has brought an end to all and my only thought right now was how and who going to lead the Tamil Nadu for next four year. Though OPS have been the Chief Minister, missing someone powerful like Jayalalitha is deceive for the people to believe in the existing regime. I really don’t know what to say rather thanking her for the best! 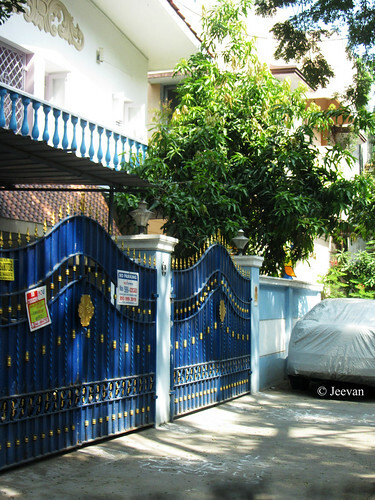 Both were shot on the same street somewhere in Thiruvanmiyur and the blue gates easily caught my sight, featuring detail in gold coat. I also liked the light fall across the house tuning the color contrast of the image. The following is a simple one with net frames, and it is a cornet house. The Ferris wheel a broke-up of rainbow? Taking this RGB Monday further, i have made a chain-link to the meme and like to invite entries who are interested on this theme. Thanks Devilish Angle for encouraging me to take up this meme into chain link… hope you all support me and share your link-in if interested. 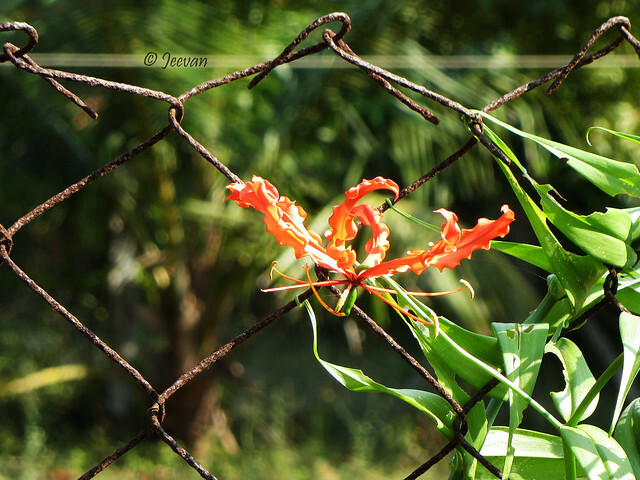 During my Sunday outing last weekend, I was surprised to see the state flower of Tamil Nadu – Gloriosa Lily – which I was looking for some time. Alike it’s other common names including flame lily and fire lily; the flowers bloomed like fire flames on the fence of a farm house near Kovalam. Kaanthal, the flower called in Tamil, has six tepals each extends up to 5 to 7.6 cm long and generally looks bright red to orange and sometimes with yellowish bases. I found two flowers; one with yellow base and the other quite bright red makes nice difference between the young and old that exhibits wavy margins. Gloriosa is a perennial herb, native to much of Africa and Asia, climb or scramble over other plants with the aid of tendrils at the ends of their leaves and can reach 3 meters in height. 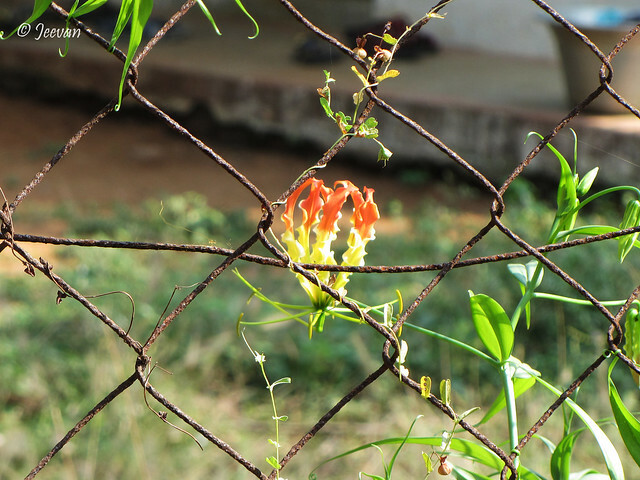 Despite its showy and ornamental flowers as it was cultivated worldwide and also as a medicine, the plant is poisonous and toxic enough to cause human and animal fatalities if ingested. It’s supposed to be a downpour season in Chennai, of course across the state of Tamil Nadu, due to northeast monsoon, but what’s happening was cool enough. For more than a week the weather feels unusually cold (even cooler than Bangalore), and in place of rain, the winter took advance, and when we were thinking that rains have concluded the tidings report of rain in few days since the low pressure in ocean turned cyclone "Nada". Even at this time of mid noon the blowing wind was cool enough to make feel goose bump and reminding the vacation times in Ooty and Kodaikanal. Though the weather was cool enough, I sense dryness during the nights and my throat get intensely dry by the time of dawn and I was forced to wake up and take some glass of water. Being a type 2 diabetes, dry throat and water loss is a common thing, but these days it has been intense and mildly interrupts the breathing. Though it sounds unlike a serious problem, the unusualness makes me feel difference and I was glad that something disturbing me mental let me go off for last few days… and i hope it disappears soon. Still I feeling wonder about the weather and the much anticipated northeast monsoon (since the widespread southwest monsoon failed to live up to) seems to be unfair this year, unlike the torrential rains that stroke Chennai and Cuddalore at this time last year and created a historic flood. First it was predicted to be an average rainfall this year and later it was announced to be less than normal and now it becomes obvious there could be minimum rainfall with the arrival of low pressed. The year has almost come to end and there wasn’t even minimum rainfall to feel happy. Even though abundant rain may cause problem, apparently we could not live without it and a small kind of suffering couldn’t be avoided sustaining for a year. Right now I am enjoying the weather that seems to be nostalgic i.e. after long time I sense refreshing through the weather of Chennai. 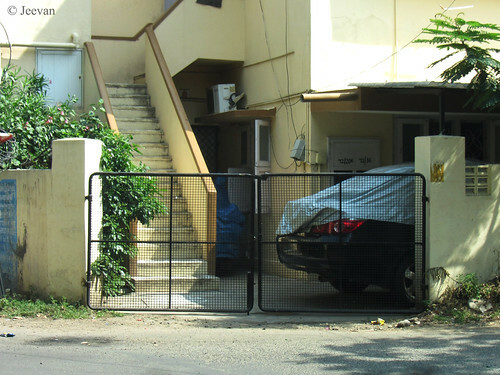 Even at the time of torrential rains (the unforgettable Dec.1) it wasn’t cool enough… if you are in Chennai don’t miss to exit whether you in office or home, just chill outside the door. Last week I was close to Elliots Beach in my powered wheelchair, testing the battery stability, as I have a doubt about its duration, come across a stretch of chain-link fence, protecting a roadside garden along the 4th Avenue of Besant Nagar, Chennai. This stretch of road is popular among the local photo enthusiasts and film crews to take photo shoots, perhaps, because of less traffic; wider in space and almost quiet among the neighborhoods. 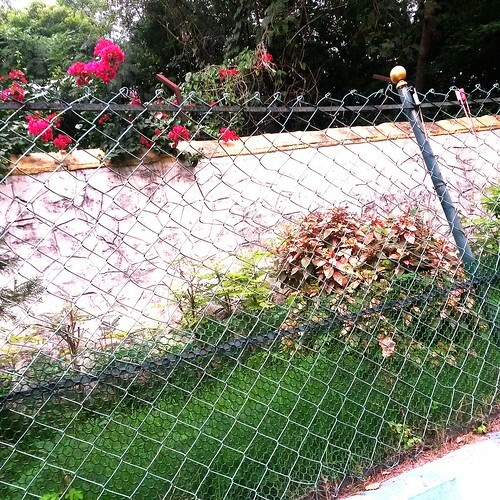 The well laid fence on one side of the road, along the high wall of Olcott memorial school or Besant Garden, with nicely maintain garden and different kind of trees stretching out the garden is an additional attraction to this road. 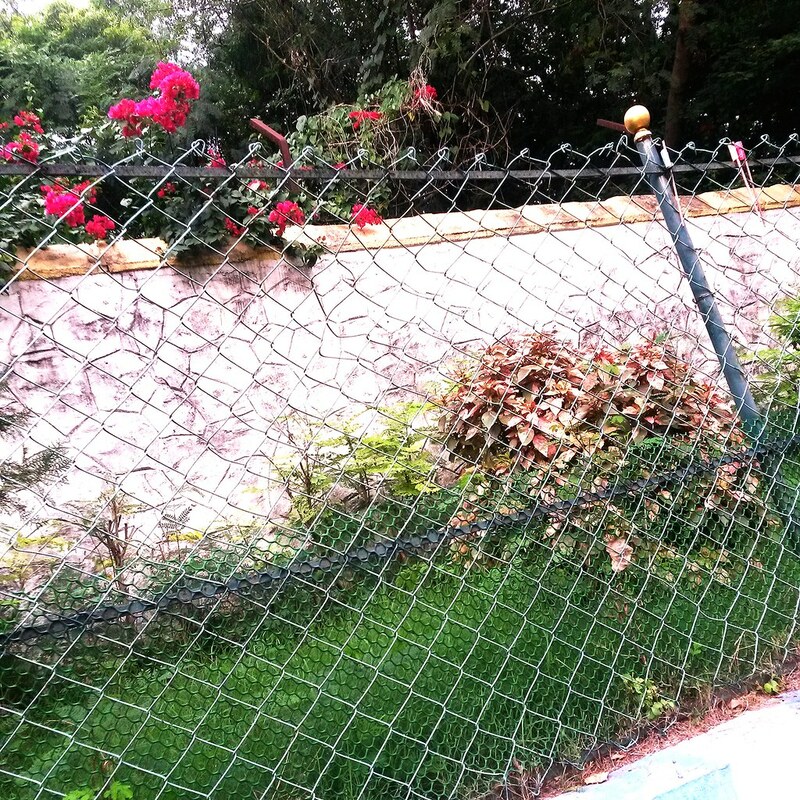 As I carry mobile along with me, I took few photos along the road particularly the chain-link fence attached to green poles along the roadside garden with colourful bougainvillea, lookout of the compound wall take my attention. In evening I see many taking walk on the road (perhaps more in morning), but little cautious is much, as the road is almost empty the vehicles speed at their own. P.S. This is supposed to be the last Good Fences link-in by Theresa (known by her profile nameTexWisGirl) of Run a round ranch, as she decided to bid farewell to her blog with this link-in for last. She has requested her link-in followers to carry on the meme… I hope someone take in charge of. Either it happens or not, I will continue to post under this meme on my personal interest. Thank you TexWisGirl… you will be remember always thought the good fences meme, and not only that way, but your support and sharing all these years in blogging. Hope you reconsider your decided later and turn back to blogging to share your support and interest. 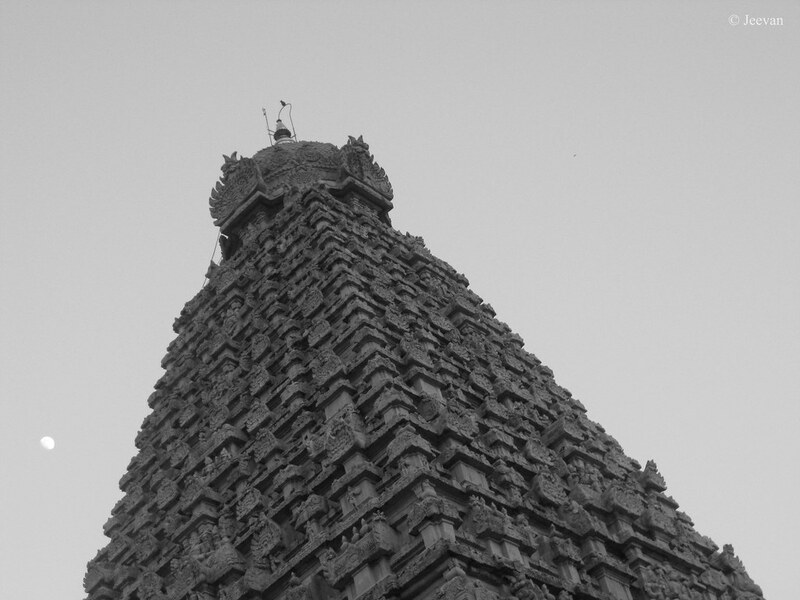 It was a dream come true for me visiting the Big Temple of Thanjavur in year 2010 – the millennium year of its built, by Raja Raja Cholan 1. 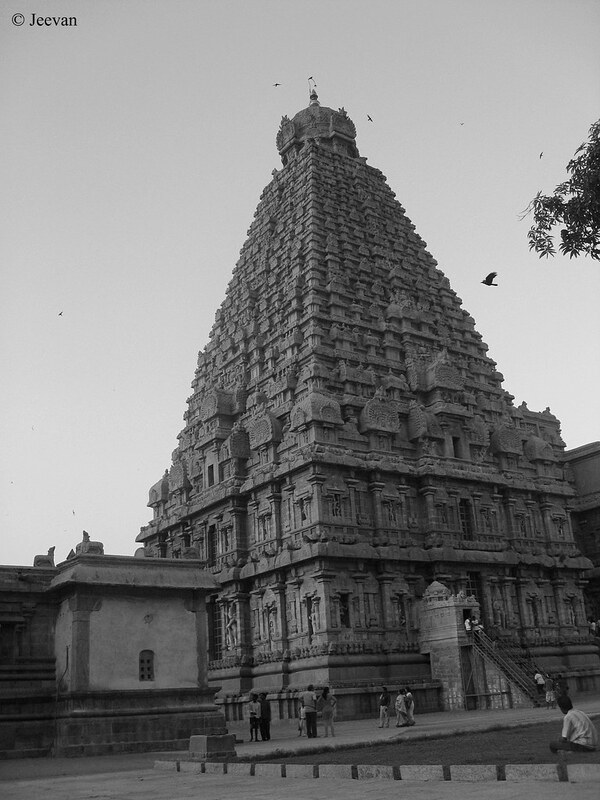 The sight of the magnificent temple tower is quite remarkable which proclaims one of the significant identities of Tamils to the universe. Standing beneath the marvelous Vimanam (the main temple tower) and known to be tallest among south Indian temples, it feel spellbind and I quite admired the structure in true amazement thinking about the narratives of history describing the building process of the temple. Each and every direction of the building exhibits the scholars of the Cholas and their thoughts, art and culture to be brought into a structure. The Big Temple also known as Brihadeeswara Temple is part of the UNESCO World Heritage Site "Great Living Chola Temples". The Vimanam (temple tower) is 216 feet high and is among the tallest of its kind in the world and the Kalasha (apex or the bulbous structure on the top) of the temple is carved out of a single stone and it weighs around 80 tons. As you all know there are monkeys (bonnet macaque) in our neighborhood and they invade our residence frequently, but lately their activities has been increased and become troublesome. We can’t let open the backdoor unlike before if no one is at hall. We have no idea when they bang and are ready to dread in no time. 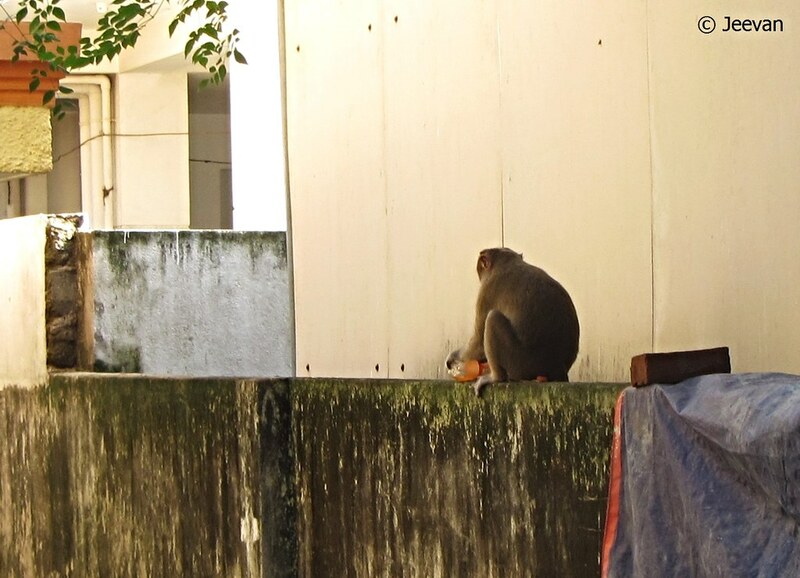 Past week a couple of big monkeys entered our home and treated on the apples and biscuits on the dining table and moreover scared my mom before she shoo them away. But they haven’t left alone, rather took away the biscuits along with the box that was full of Sunfeast Maire. This is not the first time they stole the biscuits along the box, but our pretty dog chased them away restoring the biscuit box that was almost empty. They take bunches of biscuits and force them inside their mouth to look funny with swollen on each side. There’s no surprise monkeys being like that, though they make troublesome sometime there’s some fun bear through their act like the one sipping Mirinda (a soft drink) in the picture below. 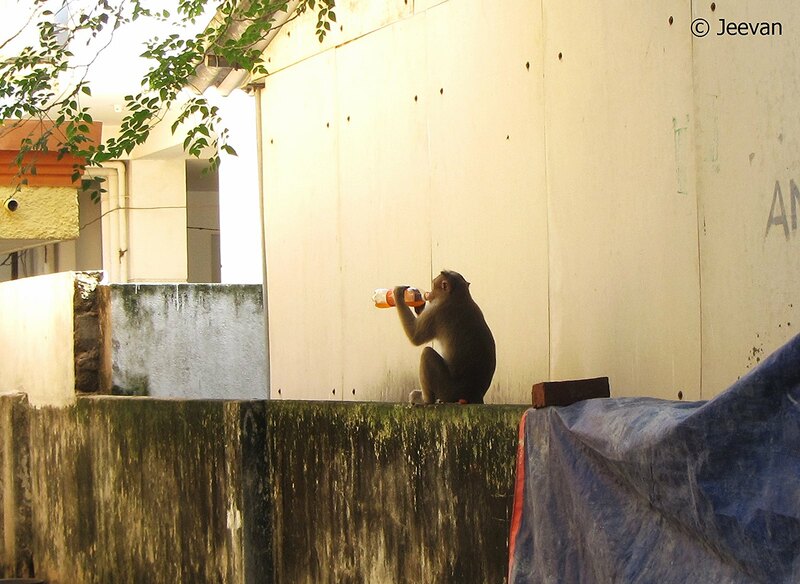 The workers, who constructed the ramp in front of our house to prevent rainwater set foot inside the home, has left the soft drink on the compound wall got into the hand of a monkey, which after rolling and drooling, lid open and tasted the juice. We couldn’t get near the monkey, fearing of unpredictable, the photo was shot from distance to giveaway the quality in images. You all aware it was Supermoon yesterday, where moon comes closest to earth in the last 68 years, appearing 14 per cent bigger and up to 30 per cent brighter than usual. Though supermoons are fairly frequent, the November 14 supermoon is a once-in-a-generation sight! There are six supermoons in 2016 and we already had four, and after next week there’s one on December 14. 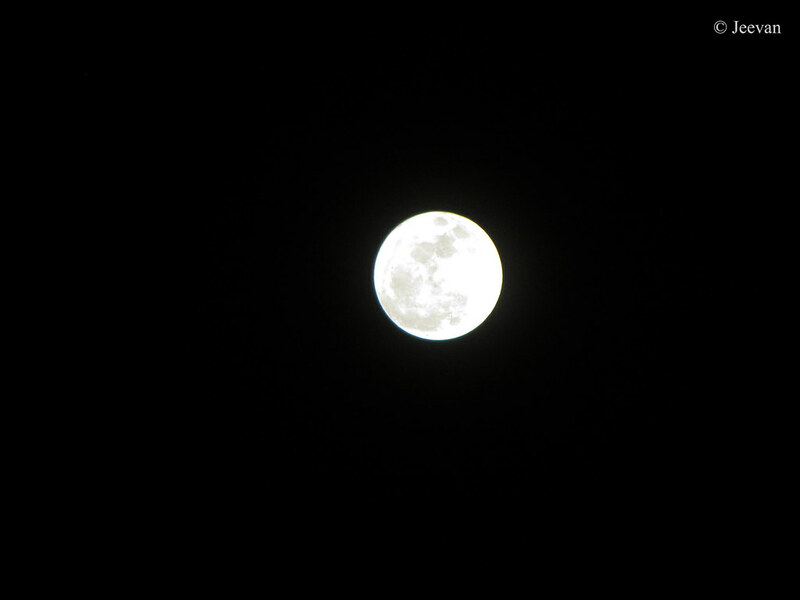 Last time I saw a supermoon was in year 2011. For some time lately my Instagram witnessed many moon shots and I have been watching the moon, as well as the sky, during evening and night times encouraged me to take live shots and upload the mobile photo-sharing app. A lonesome feeling was taking place in me for some time lately and there was a desire to come out and check things happening around to keep away my lonely feel. Though I was going through the let-down feel, the amusement got via watching the sky, in different light, colors, shades and clouds and the moon, from nothing to whole, inspires me to look forward and implants hope within. When thing being like that how I could miss the magnificent event (Supermoon) taking place at the eventide and night? For last two days I was seeing rainbow colored halo around the moon when mild clouds pass the same. The moon was truly bright last night and taking photos has been very difficult due to overexposure of light and focusing on the moon to get a detail shot, keeping away the bright light. Actually I didn’t get the detail when capturing it from the courtyard and it fall pretty white, but only after transferring into the computer I found the grey shades and thus was the brightness of the moon yesterday. Lately I see the moon pretty early in the sky when I come into the street but it only come across our courtyard by 9 pm and these photos were taken during that time. Unexpected happens everywhere and if it was the result of president election in USA, India loses the value of high priced currencies (500 and 1000 rupee notes) all of sudden from the midnight of November 8th. Though it is indeed a bold step by the government of India and an essential one to knock down the black money and illegal notes circulation, the release of 2000 notes make sense it could worsen the situation in future with chances of double the hoarding. In the age of online transaction and swiping technology we don’t need high denomination and most of them were used mostly by upper class and I also think it could increase the spending habit indirectly as wander for change is not easy. We all know it’s a temporary state of trouble (shops refusing to get value lost denominations and people rushing to banks and ATMs to exchange or deposit their hold) and this change could be nothing in few weeks when more new 500 and 2000 notes becomes stably available. I think it’s the media created perplex, because the way they conveyed the message comes shocking and it was unbelievable too first. Though we appreciate the crucial and bold decision taken by the govt. of India, the difficulties could not hide away esp. 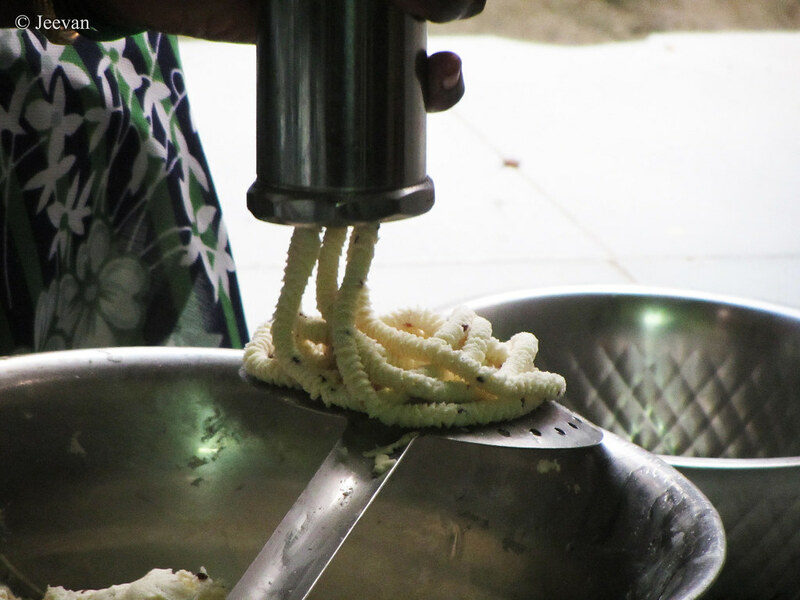 those who get wage and small scale investors hit by this move greatly. Govt. announced certain areas (like milk parlour, petrol and railway stations) where the old denomination can be exchanged by purchasing, but people had no option when they refused to accept to only postpone or go pillar to pillar in search of change. 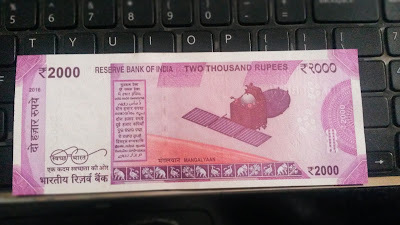 The new ₹ 2000 note really left me amaze by the number of detail it hold within to keep away fake printing. 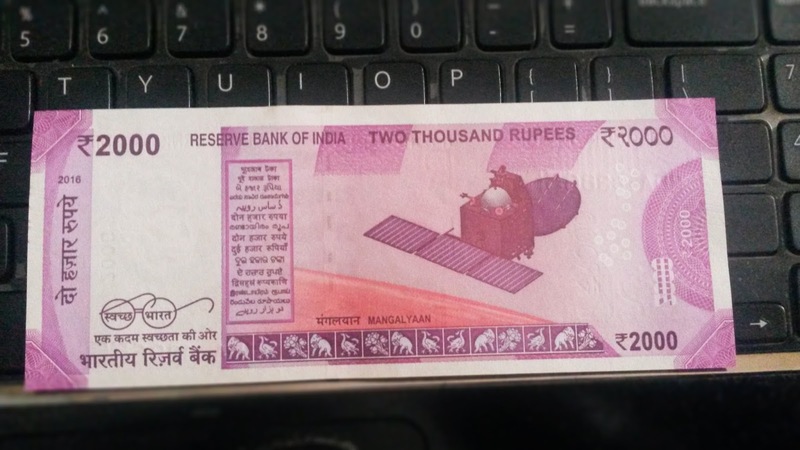 My dad bought a 2000 note yesterday after depositing an amount in bank and I was curious checking its features and I really liked the Braille work to assist visually impaired. 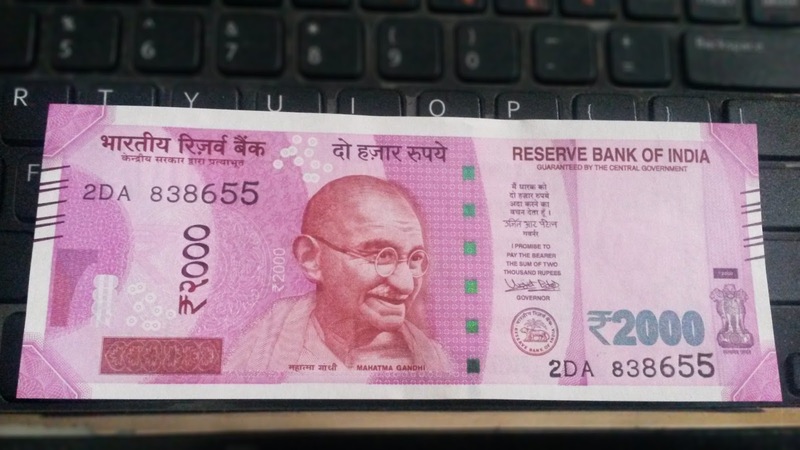 It has intaglio or raised printing of Mahatma Gandhi, Ashoka Pillar emblem, seven angular bleed lines (on left and right side of the magenta coloured note, size in 66x166 mm) and identity mark. Apart see-through numeral 2000, micro letters (RBI and 2000) on the left side of the banknote, it has windowed security thread with color shifts, where the thread changes from green to blue when the note is tilted. We have more than a month to deposit or exchange our old currencies (and even beyond that with RBI), but people seem impatient in changing the notes as if today is the last date. I don’t believe this (giving re-life to denominations in new form and price higher than before) will turn everything, but I do hope alike it helps, improves and betterment the society and banking system. Hard-earned should never go wasted. There are many films with political scenario, but I think for the first time a movie portrayed a woman politician was Kodi, though Dhanush led the movie and plays the title role. Kodi comes out as a mass political entertainer and to keep things interesting, Dhanush led a double role as elder and younger brother and Trisha as his opposite, as well as opponent, made certain its sound victory. Growing up with equal status in politics, Rudhra and Kodi make their political carrier with their parties being opposite to each other, they hold affaire secretly away from the politics. Though both being passionate in their political carrier, Rudhra is bit further in upgrading her status and ready to go any extreme to fulfil her dreams whereas Kodi seeks straight forward and true to his love. How this differentiation mingles makes the movie. Movies with equal importance to opposite gender aren’t frequent, and Kodi generated the theme well using the strong characterization of Rudhra (Trisha) and this could be a milestone role for Trisha who had done number of films. For the smart looking actress, the negative shade is quite new and for most of scenes she appears in her natural tone. Dhanush, as usual becomes the show stealer and this time in two characters shown the variation well and worked simply. With two back to back hits (Ethir Neechal and Kakki Sattai), director R.S. Durai Senthilkumar has sustain his success with Kodi, having a fast paced screenplay boredom has kept away. 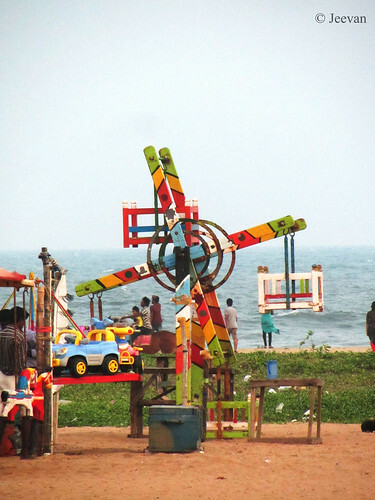 Though we sense dullness in picturization, perhaps due to the condition of weather or mistake in display at the drive-in theatre, and the story being not unpredictable there are some twist to keep it interesting. Kodi also highlights the issue of toxic mercury waste (that threatens the pristine of Kodaikanal) but it was just a matter of fact and doesn’t take serious foot. Santhosh Narayanan’s composition has supported the movie at its best and I liked the songs that make nice listening and intertwine the subject. Anupama Parameswaran makes a cute presence as second heroine and S.A. Chandrasekhar’s role as Thalaivar (leader) done with honor. 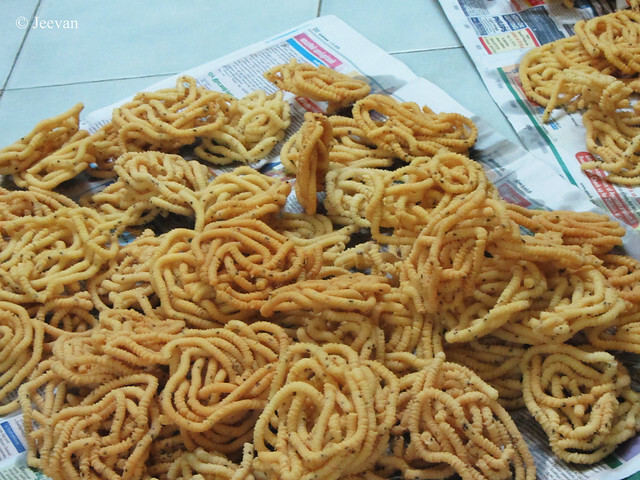 Murukku is a traditional south Indian food/snack and it can either brought from the store or homemade using rice flour, fried gram and butter as main ingredient. Alike every year, this year too we made Murukku (along with Adhirasam – a traditional sweet) at home during the Deepavali, where one evening mom and aunt sat on the floor for preparing the same and I used the opportunity to take some photos on the process. Making sweets and snacks is a custom for us or we practice during Deepavali and distributing it to our relatives, friends and neighbors as a sign of sharing our festival spirit. The flour is filled on the Murukku maker – a vessel, where flour being pressed (using a handle on top) to get strings of dough through small holes at the bottom. Just like in the photo below. A circular layer of Murukku (after swirling strings of dough) on the ladle before drop into the hot oil boils in the pan, to get a view as below. 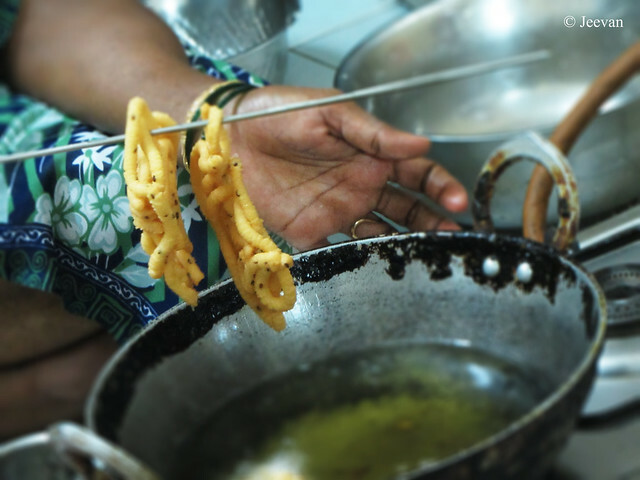 The Murukku get fried after two or three twist and turns in the hot oil in the pan, and once turned deep yellow or orange is lifted using a stainless steel stick like the process below. Being a follower of Betsy’s Joyful Reflections, I have admired the beauty of Iris bloomed in various colors and patterns, many a time in her blog. I have been to mountains many a time, and have seen variety of fancy flowers bloomed in the gardens and cottages we have stayed, but I ever seen an Iris until last year when I visited Cloud Mountain. 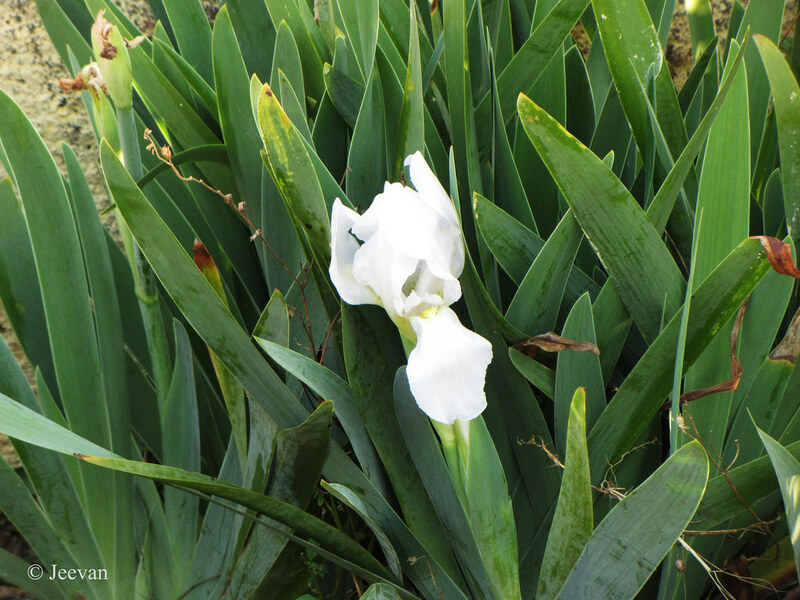 I was really amused to find a White Iris bloomed in the courtyard of the guest house we stayed in the Cloud Mountain. 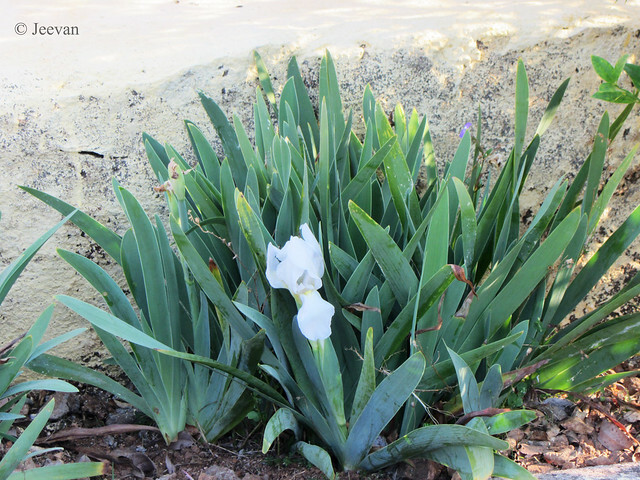 One side of the huge courtyard has a flower bed lined by some beautiful flowering plants and the White Iris was the only blossom from the few Iris plants grown as cluster of leaves. Iris is a perennial plant grows from bulb and usually has 3-10 basal sword-shaped leaves growing in dense clumps. The flowers are in the shape of a fan and contain one or more symmetrical six-lobed flowers. The three sepals, which are usually spreading or droop downwards, are referred to as falls. The Iris I capture seems to be Immortality Re-blooming or Bearded Iris boasts of pure white petals with a lemon beard (a tuft of short upright extensions growing in its mid-line), which are the plants filaments. Iris is a name derived from the Greek word for a rainbow, which is also the name for the Greek goddess of the rainbow, Iris. 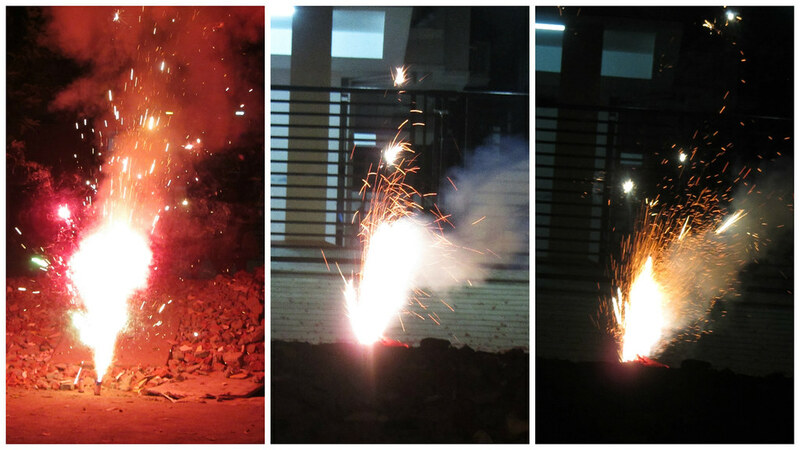 This year’s Deepavali wasn’t bad but I was disappointed in many ways. First thing was I was unable to get out of the house, taking a glance at the neighbourhood’s Deepavali celebration, because of the preventive action (for rainwater) taking place at the premises that blocked the gateway for my wheelchair to pass on. Only 2013 Deepavali went off quite inside the house due to my fracture in leg and now I was fine but the situation turned against me to ban me coming out of the house. 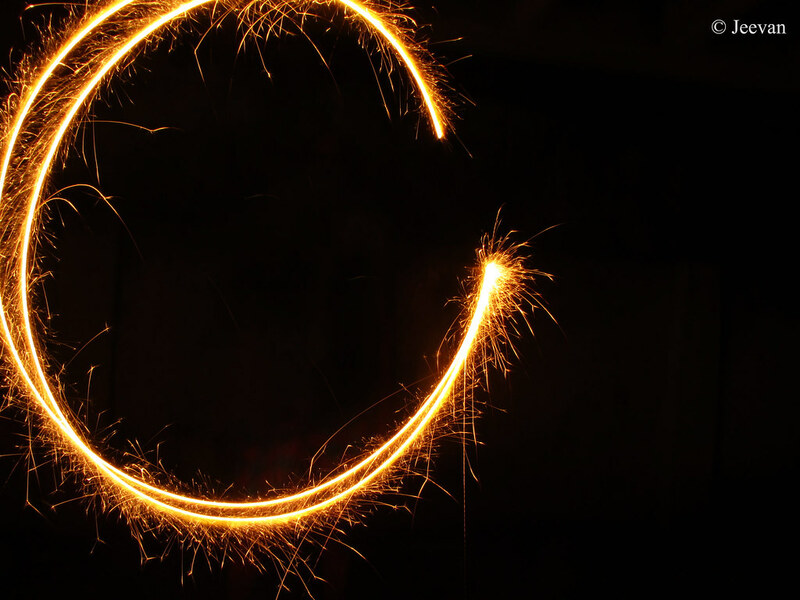 I ordered some fireworks at online and had fun watching them lighting up in the evening with the help of one of my uncle who had come home and I took his company and thus it kept away my lonesome celebration. Though I didn’t expect my cousins to greet me on the occasion or share the moment (I believe expectation is the main reason for disappointment, but that’s not mean not at all to expect), there’s something make me frustrated about their lack of present or interest showing up during the festival of lights. I know attitudes/priorities change as people grow and expose to various things, but I strongly believe that festivals and special occasions are created for people to come together and experience the happiness by sharing. 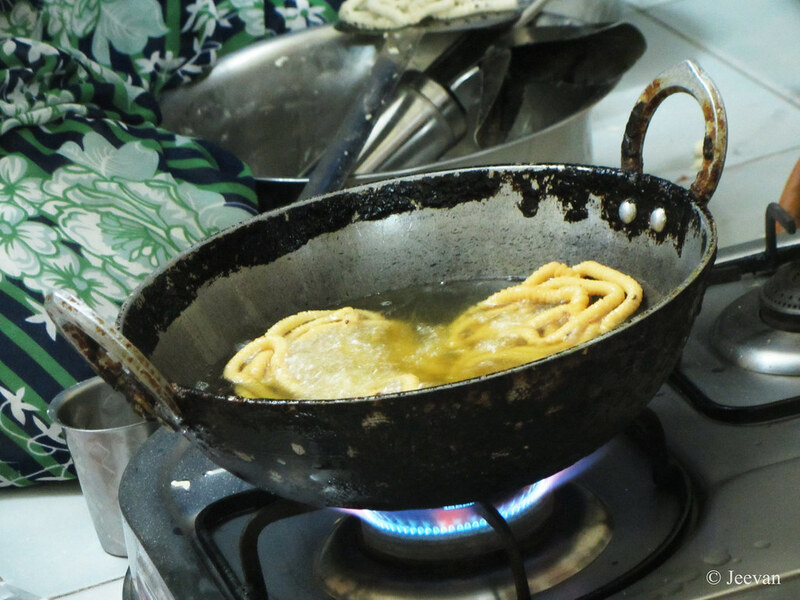 I believe sharing is the concept behind everything and meaning of life is truly depended on something sharing. Though there are lonesome occasions to enjoy our solitude and to do things that quite independent, there’s always someone to support each other and look forward to lead happy relationship. We had brought nothing to take away, but I know, to live we need to hold on and relationship is one strong hold that keep us supporting wherever we go. The relationship I mean here is beyond family relation and I have come to see life beyond a circle where connectivity and sharing happening between people who doesn’t need to be our relatives or friends. The passed 2016 Deepavali left a notion in me to find things and happiness using my self-intention and interest with people available, either they hold a similar perception or not. Though this is not the first time I come to a conclusion alike and I’m one easily melt away however strong iceberg I am. Lol. There are certain things we could sacrifice or adjust to lead a relationship but not with one who couldn’t consider or remind about a relationship exists. 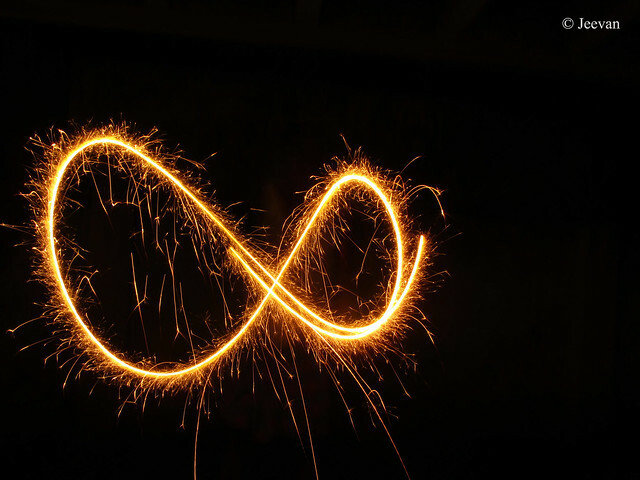 We haven’t come into this world without anyone’s support and there had been people at our various stages of life, we perhaps forget some or some missed away from sight or contact, but there should be someone dear or closely connected with whom sharing becomes imperative. Though we can’t force anybody to sustain in relationship, but missing someone during special occasion hurts and it really needn’t to be exposed because it hurts more when they refused directly. I know I began somewhere and end here. 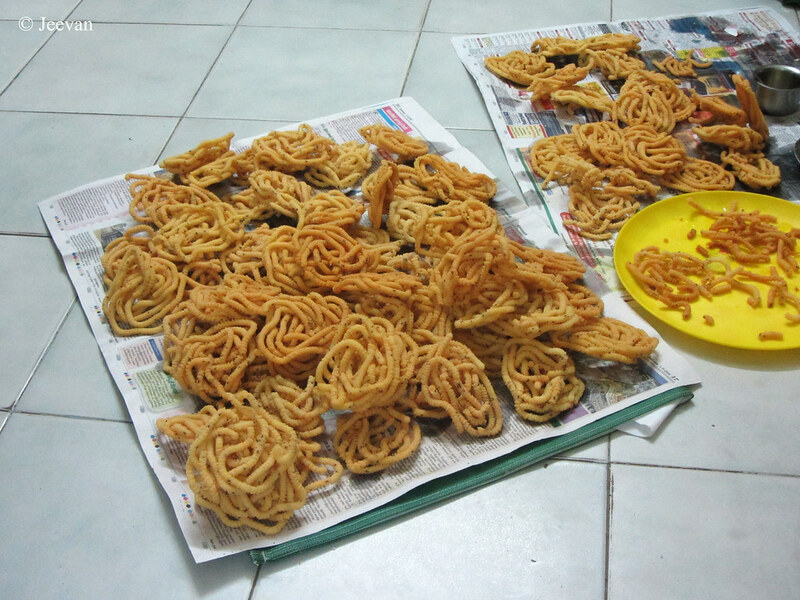 Anyway I had a wonderful Deepavali and the happiness sharing sweets with few neighbors, and lighting fireworks and the company of my uncle and spending time on television makes feel good. This year the noise of crackers has been less, thanks to the awareness of people, but still our neighborhood burst heavy and made more smokes to prevent us coming out of home. 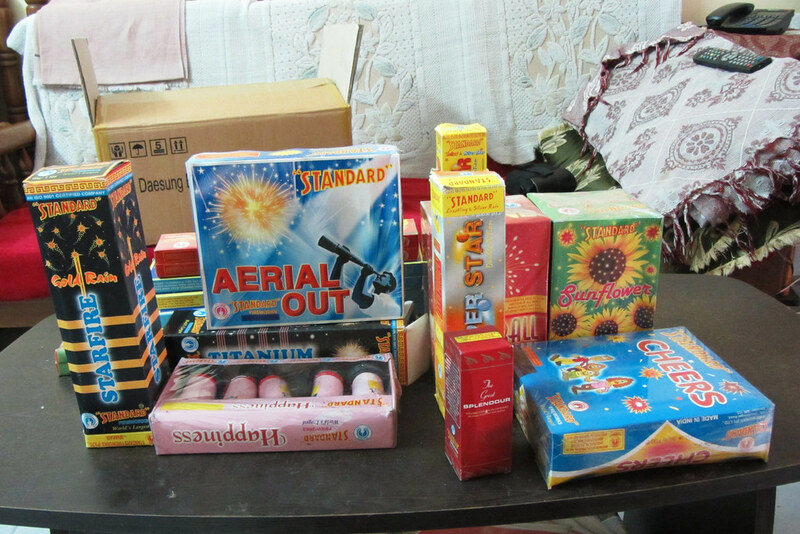 I hold interest more on fireworks that turn sky with magnificent light and colors. 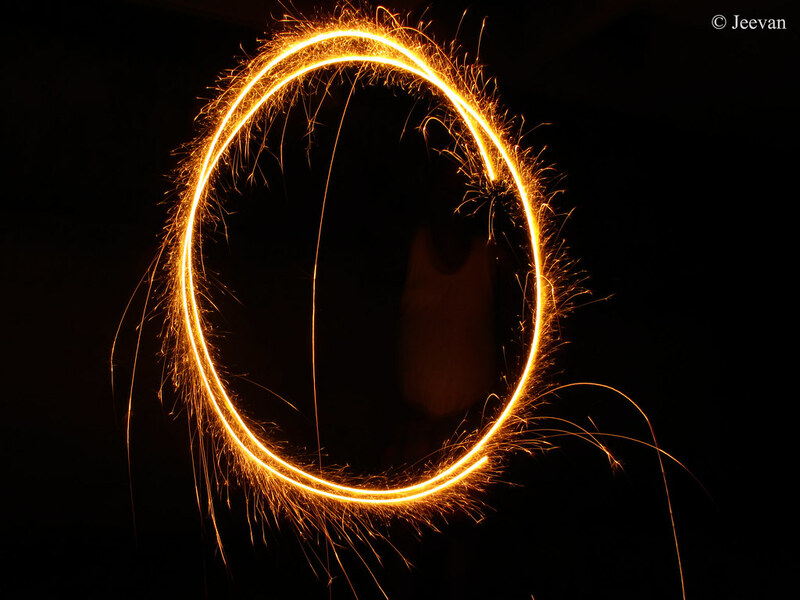 Below is few shots just took for fun using firework sparkles.